June 16, 2017 – Engineers working on NASA’s Orion kicked off summer with a series of important tests for some of the spacecraft’s critical safety systems. In the Utah desert, the skies over Arizona and the water at Johnson Space Center in Houston, the team is making sure Orion is safe from launch to splashdown. The team developing and building Orion’s parachute system that ensures the crew module can safely descend to Earth evaluated how the parachutes perform during a scenario in which an abort while on the launch pad is necessary. 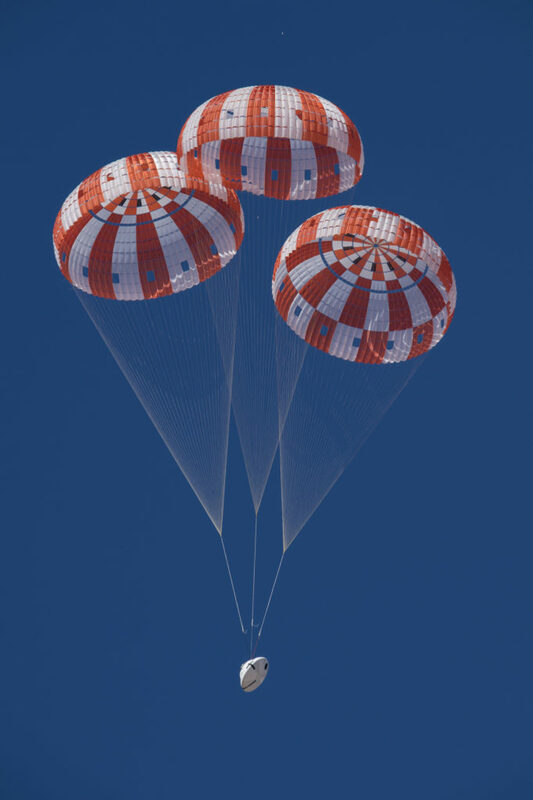 When Orion returns to Earth from deep space missions beyond the moon, the system will customarily deploy 11 parachutes in a precise sequence to help slow the crew module down from high speeds for a relatively slow splashdown in the Pacific Ocean. But the parachutes must also be capable of sending the crew module to safety if it were to be jettisoned off a failing rocket without time for the full deployment sequence to occur. In a June 14 test at the U.S. Army Proving Ground in Yuma, Arizona, engineers dropped a mock Orion capsule out of a C-17 airplane at 25,000 feet in altitude to test how the system will fare when only Orion’s three main orange and white parachutes deploy. The test evaluated performance when the parachutes experience a low altitude and low dynamic pressure. Orion’s parachutes are in the midst of being qualified for flights with astronauts and put through a variety of normal and failure scenarios over the course of eight total tests to ensure the parachutes can safely help the crew module and the astronauts inside safely descend. At the Promontory, Utah, facility of Orion subcontractor Orbital ATK, engineers tested the abort motor for Orion’s launch abort system June 15, firing the 17-foot tall motor for five seconds. The motor was fastened to a vertical test stand with its nozzles pointed toward the sky for the test. It produced enough thrust to lift 66 large SUVs off the ground and helps qualify the system for future missions with astronauts. The launch abort system is positioned on top of the Orion crew module and will play a critical role protecting future crews traveling to deep space destinations in Orion. The abort motor is responsible for propelling the crew module away from the Space Launch System rocket in case of an emergency, and one of three total motors that will send the crew module to a safe distance away from a failing rocket and orient it properly for a safe descent into the Atlantic Ocean if such a situation ever occurs. While engineers are just getting started analyzing the data, the test verified the motor can fire within milliseconds when needed and will work as expected under high temperatures. This month the Orion team is also evaluating an updated design to the crew module uprighting system, the system of five airbags on top of the capsule that inflate upon splashdown. In high waves or wind over the ocean, the uprighting bags are responsible for turning Orion right side up if the capsule lands upside down or turns over when it returns to Earth. Engineers have retooled the design of the bags after they didn’t properly inflate during Exploration Flight Test-1. The testing is taking place at the Neutral Buoyancy Lab at Johnson, where the team is performing eight tests evaluating the bags during both normal inflation and failure scenarios to validate computer models. The testing in the calm waters of the pool helps the team prepare for a late-summer complement of uprighting system tests in the Gulf of Mexico off the coast of Galveston, Texas. “We’re making important headway this summer with all of our landing and recovery systems testing,” said Ali. Lockheed Martin of Littleton, Colorado, is the prime contractor for the Orion spacecraft. Beginning with the launch of the first integrated mission of SLS and Orion (Exploration Mission-1), this new deep space exploration system will support missions of increasing complexity over multiple decades.